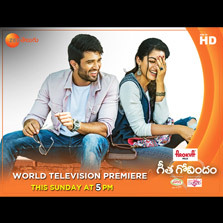 Zee Telugu promises to increase your celebration quotient this festive season with the World Television Premiere of blockbuster film Geetha Govindam. Starring Vijay Deverakonda and Rashmika Mandanna in blockbuster Geetha Govindam, the movie promises a high entertainment quotient. With a blockbuster movie and an opportunity to win Diwali hampers, it literally calls out for 'Inkem Inkem Kaavaale?' this festival. Tune-in to Zee Telugu and Zee Telugu HD on 4th November between 5:00 PM to 8:00 PM for your best-ever-yet Diwali! Viewers will receive the opportunity to answer 6 questions regarding Geetha Govindam that will be appear during the movie telecast. Lucky winner will be announced every 5 minutes during the 3-hour movie duration who will receive exciting prizes like electronic items, pattu sarees and gadgets as Diwali gifts. Vijay Govind (Vijay Deverakonda), a typical youngster who likes to goof around with his mates, is also a young college lecturer who dreams of getting married and settling down with a woman, and happens to run into Geetha (Rashmika Mandanna). While Geetha is a level-headed woman who is wary of strangers and is convinced Vijay is an irresponsible youngster, despite his efforts to persuade her to believe otherwise. The story unfold just when things start stirring in the right direction and Vijay makes a huge blunder that could cost him his love life and his family. The blockbuster film that earned 100 crores also earned a big thumbs up for its brilliant scripting, great use of humor, and the music that only enhances the viewing experience every further. Director Parasuram's sudden plot twists will guarantee to have you at the edge of your seats, to say the least. 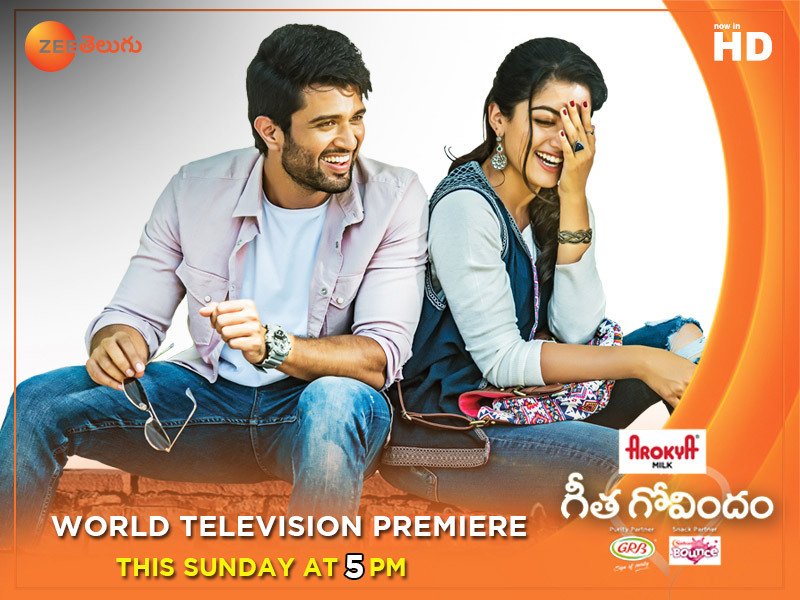 Tune-in to be thoroughly entertained with the World Television Premiere Geetha Govindam on 4th November between 5:00 PM to 8:00 PM only on Zee Telugu and Zee Telugu HD.